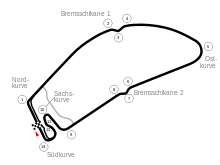 The 1977 German Grand Prix was a Formula One motor race held at Hockenheimring on 31 July 1977. It was the eleventh race of the 1977 World Championship of F1 Drivers and the 1977 International Cup for F1 Constructors. The German Grand Prix was moved to Hockenheim following Niki Lauda's near-fatal accident at the dangerous Nürburgring in 1976. This was the second time the race was held at Hockenheim, the first being in 1970. The 47-lap race was won by Lauda, driving a Ferrari. Jody Scheckter finished second in a Wolf-Ford, having started from pole position, while Hans-Joachim Stuck was third in a Brabham-Alfa Romeo. In qualifying, Jody Scheckter took his first pole of the season, ahead of John Watson and then Niki Lauda who headed the second row. Scheckter kept the lead at the first corner with both Watson and Lauda keeping their positions. Watson put pressure on Scheckter until his engine failed on the eighth lap, giving second to Lauda who passed Scheckter soon after and began to pull away. Scheckter battled for second with James Hunt until the defending champion retired with an engine failure, giving third to Watson's teammate and home driver Hans-Joachim Stuck. That was how it stayed to the end; Lauda winning from Scheckter and Stuck. German Hans Heyer did not qualify, but started anyway from the pit lane, only to retire with a mechanical failure. He was later disqualified. This was the 100th World Championship race victory for tyre manufacturer Goodyear. ^ "1977 German Grand Prix". formula1.com. Archived from the original on 21 October 2014. Retrieved 23 December 2015. ^ "Strange but true: F1's weirdest and most amazing records". formula1.com. Retrieved 19 December 2016. ^ a b "Germany 1977 - Championship • STATS F1". www.statsf1.com. Retrieved 18 March 2019.